IIFA Awards is among the internationally acclaimed ceremony. IIFA 2016 is 17th in the series and this year is in Madrid, Spain from 23 June to 26 June. A lot of eyes are anxiously awaiting the results. The Bollywood fans are spread all across the globe and are eager to know about the result of their favorite actors and movies. IIFA 2016 is like Oscars for Bollywood. It is one of the top celebrated events. Bing team brought a unique idea to share with its users across the globe and are eager to know the results. Bing is providing the sneak peak to all who are enthusiastically searching for any kind of information about Bollywood's biggest nights. This is Bing team's Bollywood debut with a bang presenting an interactive IIFA knowledge bank repository to help millions of Bollywood fans who can check out all the nominees and a lot more. Not only this, Bing also brings a prediction center online to let you know who all will go home with a statue this year. This is a unique Bing Experience for millions of fans to explore anything about films, directors, music, actors and other category nominations for these awards and get precisely exciting results from the IIFA Gala event location. A similar kind of activity by Bing in predicting winners for Oscar witnessed a great success of Bing team. Almost 80% of the predictions were accurate. The same was the case with Grammy. Rather the results were around 91% which was a great success for Bing predictions. With the same concept Bing has not entered the Bollywood arena for the first time, starting with IIFA awards. Bing predicts is based on the search, social and other relevant data thus making intelligent predictions and adding a different dimension to the entertainment world. 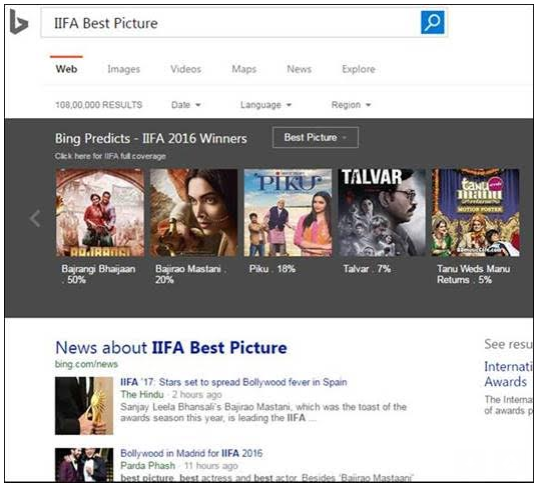 Bing Predicts uses real-time information to update fans in a unique manner thus predicting the winning chances of their favorite movies and stars thereby truly experiencing the real magic of IIFA 2016. 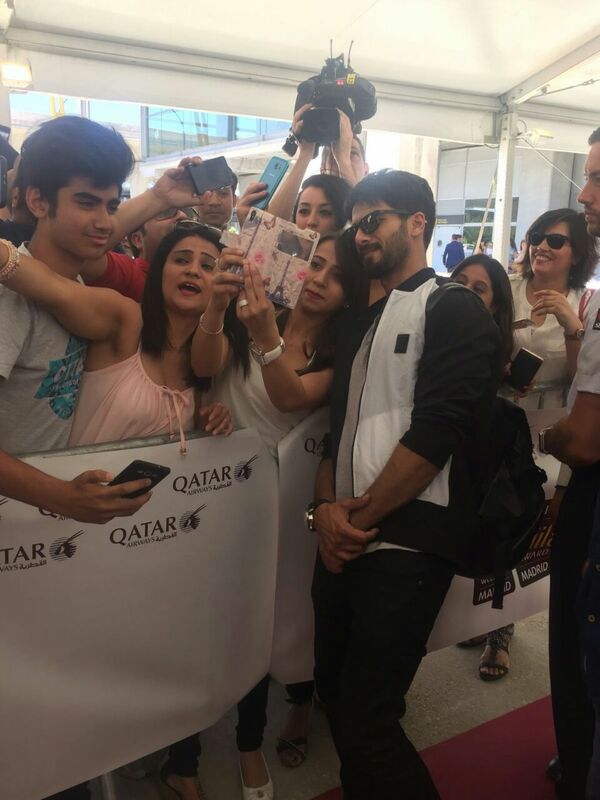 The users will be getting highlights of IIFA 2016 with latest updates. MSN India is, in fact, the official digital partner for the event. The predictions will be there for winners in 8 categories at the 17th IIFA awards. Bing Predictions are also available on UCWeb's top websites section and on IIFA hub on MSN India to enable users an easy access to the results. Earlier the 17th edition of the IIFA celebrations unfolded two days back, on 23rd June with a big bang in Madrid, Spain, under the celebration of the International Indian Film Academy Awards – IIFA 2016. Qatar Airways welcomed Bollywood celebrities as they arrived at the Adolfo Suarez Madrid – Barajas Airport. The carpet of the Bollywood Oscars took place at the meet and greet of the VIP parking lot situated at the arrivals zone of terminal 4. Qatar Airways is the official airline of the International Film Academy 2016. It welcomed the Bollywood celebrities with a burgundy carpet in parallel lines to Hollywood's red carpet. 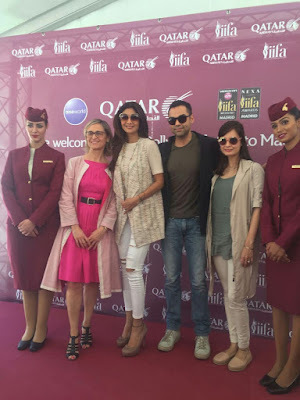 Marimar Laveda, Country Manager of Qatar Airways for the Iberian Peninsula, Greece and Cyprus assisted the event welcoming the Indian cine stars. Prominent Indian personalities and a large number of fans have traveled to the Spanish capital to assist the globally acclaimed festival. Some of the many Bollywood stars and celebrities that will assist the festival and participate in the biggest Indian Film Awards show internationally are Eminent names like Anil Kapoor, Sanjay Dutt, Sridevi, Boney Kapoor, Sanjay Leela Bhansali, Shabana Azmi, Javed Akhtar, Rakeysh Omprakash Mehra, Boman Irani, Kabir Khan, Ranveer Singh, Bipasha Basu, Huma Qureshi, Vivek Oberoi, Dia Mirza, Riteish Deshmukh, Neha Dhupia, Madhavan, Aftab Shivdasani, Sohail Khan, Sajid Nadiadwala, Shriya Saran, Sonu Sood, Jackie Shroff, Richa Chaddha, Frieda Pinto, Lara Dutta and Mahesh Bhupathi.